SPACE GULF can provide total power solutions to telecom, Oil and Gas and Manufacturing sectors of KSA and throughout the region. We have an expert team with over 45 years combined experience and knowledge in the areas of design, integration, installation and maintenance services. Our mission is provide reliable and professional services with engineered solutions and tailored to our client’s specific requirements. The reliability of power source plays an important role in the overall performance and availability of any system. We have earned good reputation by providing quality equipment and excellent after sales support to our customers. 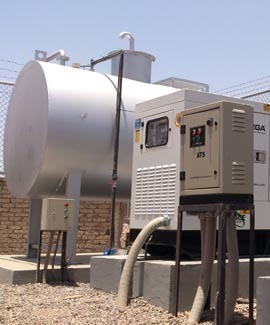 SPACE GULF covers Power generation whether it is conventional Power generation using Diesel / Gas as fuel or Renewable Energy systems i.e Photovoltaic Solar Power systems converting Sunlight in to Electricity or Solar Diesel Hybrid System where cost is the price concern and sites are not too difficult to access and maintain . In addition SPACE GULF also covers Power Conversion equipment including AC-DC convertors, Telecom and Industrial grade Rectifiers, Battery Chargers, Batteries, DC/AC inverters and DC-DC convertors etc. The highly professional and experienced staff ensures a total customer satisfaction backed up by service and spares department.